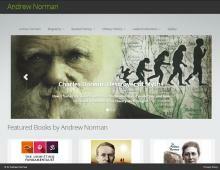 Andrew Norman is an English author who specialises in biography, general history and military history books. He worked as a General Practitioner for 11 years before a spinal injury left him unable to continue in that profession. Over the following years he underwent several surgeries in an effort to fix his back problems and it was during this period that he began writing. Andrew Norman’s most recent published work is The Unwitting Fundamentalist. In it he explores the origins of religion and the differences between each of them, the causes and motivations behind those who become religious fundamentalists and why, once somebody becomes a fundamentalist, it is almost unheard of them changing their minds and going against their beliefs. In a world where religious fundamentalism is front page news on an almost daily basis The Unwitting Fundamentalist tackles the topic in an extensive and balanced manner. Visit Andrew Norman books to learn more about the man himself and to explore his full list of published works, each accompanied by a synopsis written by Andrew Norman, with information on how you can purchase them.